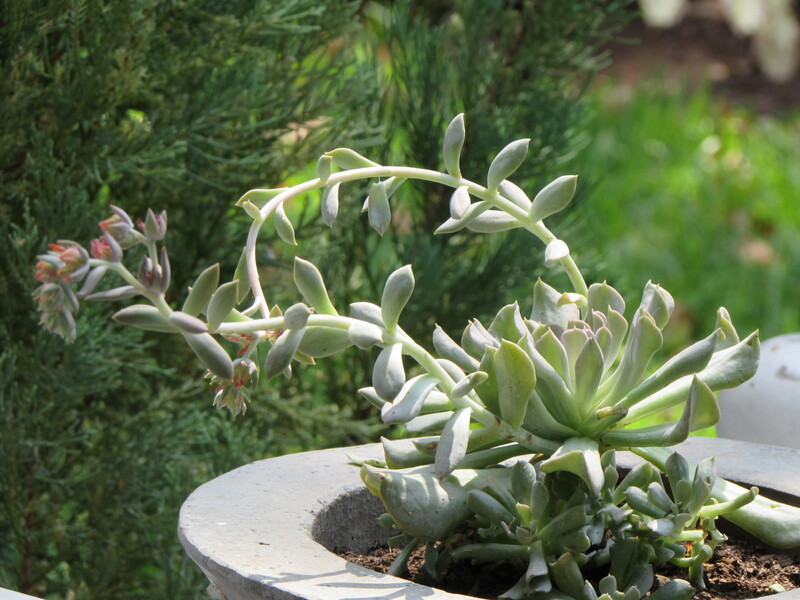 My Nod to Portland…meet Topsy Turvy Echeverias in their new urns! 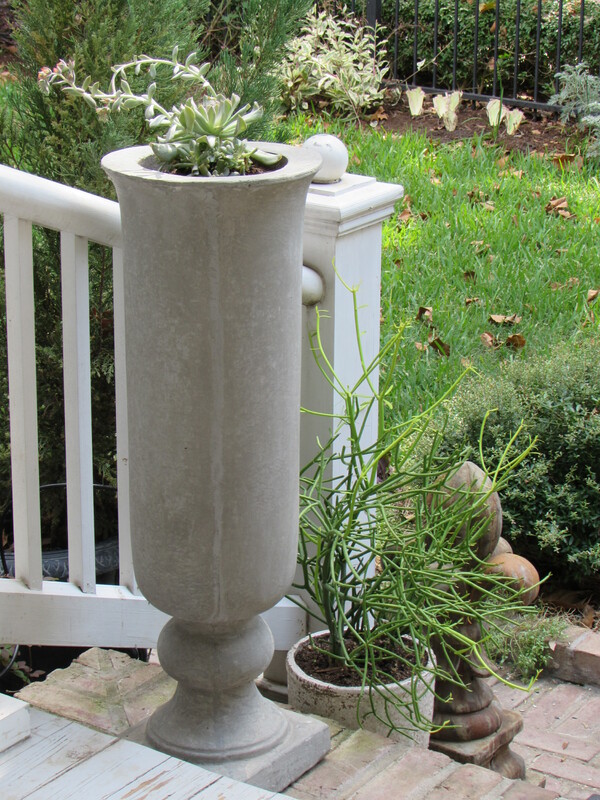 Whenever I see my lovely urns planted with succulents I will think fondly of the gardens of Portland! On my recent trip attending the Garden Blogger Fling I was inspired by all the lovely container filled with cacti and succulents that we saw at so many of the gardens we visited. Portland has a very temperate nearly Mediterranean climate. That was a surprise to me! Ever since I got home I have had the desire to add more art and containers of succulents to my garden. Succulents are difficult to grow in our clay soil. But if you put them in containers they are fine except during a hard freeze, when they will need protecting. 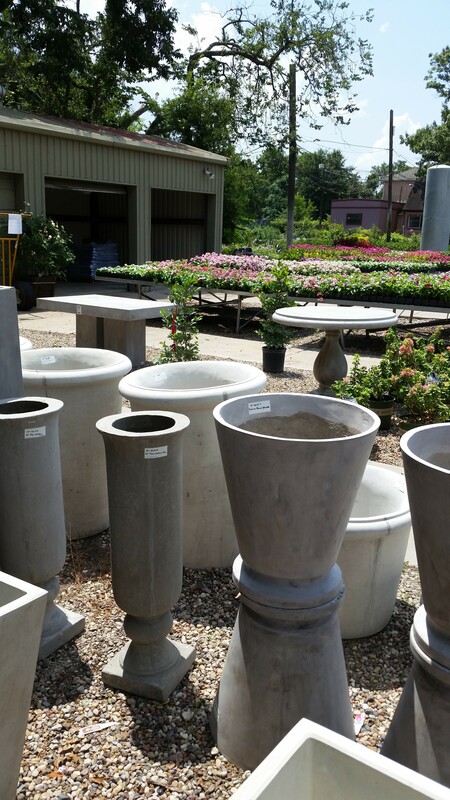 While looking for annuals to put in a few gardens we were doing maintenance on, I found these wonderful urns. A few days later I found these fun succulents. Echeveria runyonii ‘Topsy Turvy’ – a succulent from family Crassulaceae (Stonecrops) native to semi-desert areas of Central America, from Mexico to NW South America. The genus Echeveria is a large genus of flowering plants, species, runyonii. It is sometimes called Mexican Hen and Chicks. It was named by past Huntington Botanic Garden Director Myron Kimnack. The genus Echeveria is named after the 18th century Mexican botanical artist Atonasio Echeverria y Godoy in 1828 by the French botanist Augustin Pyramus de Candolle (DeCandolle) who was very impressed with Echeverría’s drawings. The correct pronunciation for the genus is ek-e-ve’-ri-a, though ech-e-ver’-i-a seems more prevalent in the US. 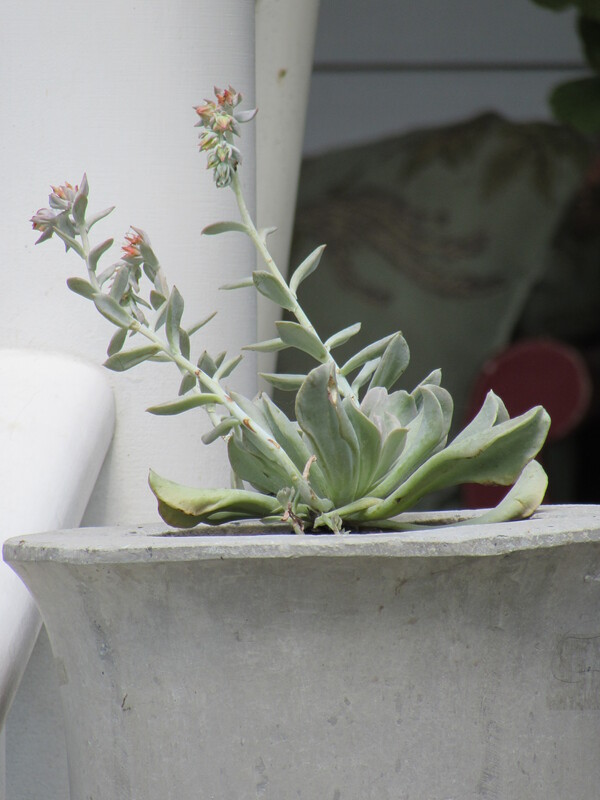 Topsy Turvy is a fast growing rosette-forming succulent with thick silver-blue leaves that curve upwards with inverted tips pointing back towards the center of the plant. The individual rosettes can grow about 6 inches tall and as large as 1 foot across. It multiplies by sending pups out around the base and grows in a mounding formation. It flowers on long arching stalks that rise above the foliage with apricot coral blooms in late summer or early fall. It is hardy down to 25° F, some sources say even colder. I think it best to cover them here in Houston or better yet move them inside during a hard freeze. Echeveria prefers medium water. It is important not to let the soil dry out completely or get so wet the roots rot. When watering water the soil not the rosettes. Over or under watering can both lead to wilting, shriveling and dropping of leaves. Observing your plant while you get the watering right is important. Like most Echeveria Topsy Turvy is shallow rooted and needs well drained soil. I have read that “sandy” in the soil requirements for succulents simply means that the soil needs to drain well. If you do add actual sand to your soil, make sure that it is coarse grained. Fine sand will clog the air pockets in the soil. 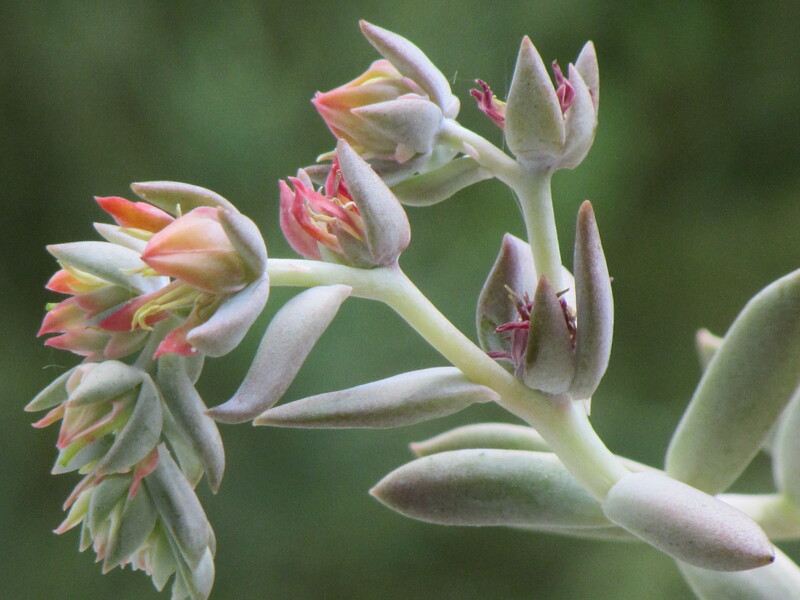 Fertilizer is not a continual requirement for Echeverias. These succulents grow natively in soil without a lot of nutrients. 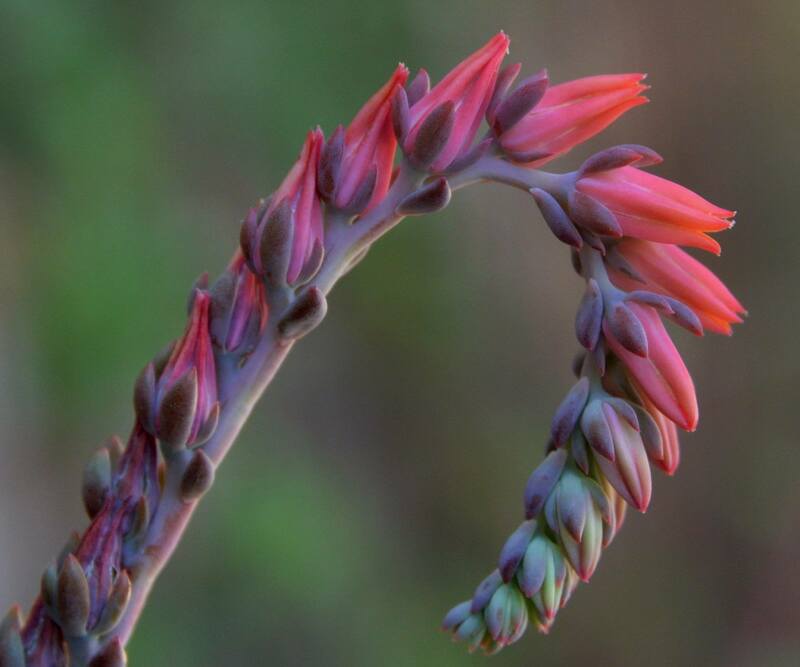 Echeverias like light similar to what they’re used to in their native growing grounds. They thrive in full sun but can tolerate light shade. However, try to avoid drastic changes in sunlight and summer afternoon full sun. Even though my porch faces west the late afternoon sun is blocked by very tall Sycamore trees. When moving plants from lower light conditions (indoor to outdoors) into full sun, be wary of sun scorch, most easily avoided by ensuring plants are well-watered before moving them on a cloudy day. The more light a plant gets the better it will display its colors and shape. 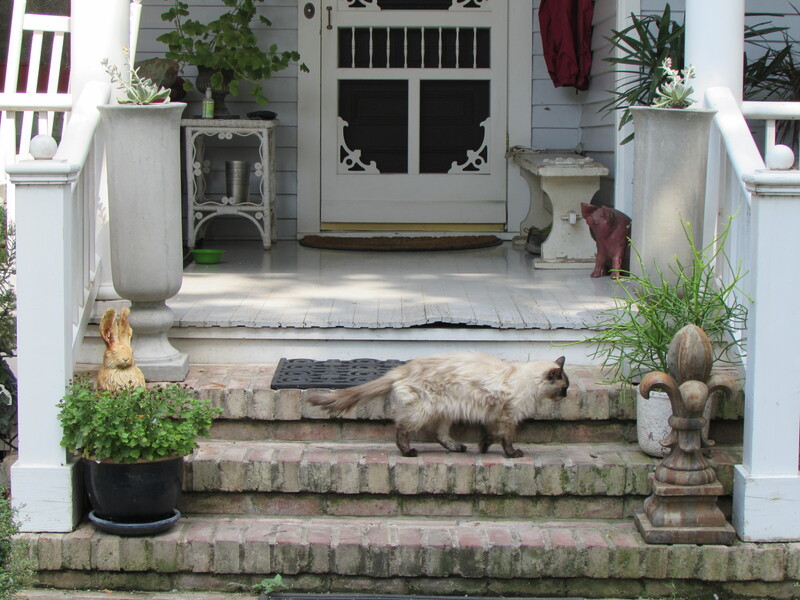 I have put mine in lovely tall urns that flank top front step. Viola my 16 year old cat photo bombing my shot! Yesterday the Texas Native Plant Society posted this beautiful picture on Facebook. 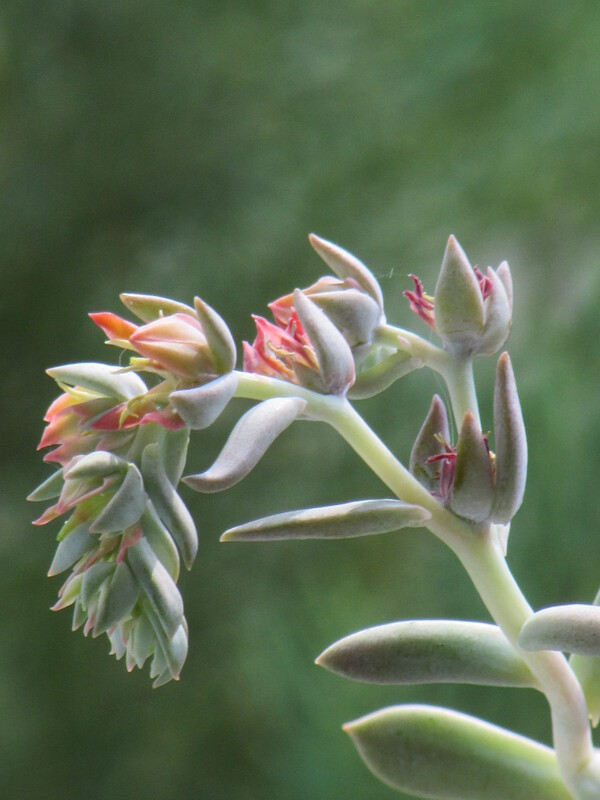 It is an Echeveria native to the Big Bend region of Texas. According to Michael Eason the photographer that took this picture this is the only species of this genus found in the United States, and is only found in Presidio, Jeff Davis and Brewster Counties. I wonder where I could find one for sale? Echeveria strictiflora (Crassulaceae). 31-JUL-2014. Capri Gardens, Marfa, Presidio CO, TX. Seed grown from Jeff Davis CO population. I like succulents in containers too. Love the colors of Topsy turvy. I have avoided them for years because I have to move them inside with our new winter weather patterns. Last year my kitchen looked like a jungle. Luckily it is a big old farm sized kitchen and had loads of room. Perfect container for that spot, although I wish I could see the lovely base a bit more on the right. I was great to meet you in Portland, Laurin. Hope to see you next year in T.O. Thank you Helen, it was wonderful to meet you and I am so excited about T.O. so is my husband, he saw all the fun I had and is joining me next time. I do see your point about the base…I haven’t played with what is on the other steps. It is to hot here to think in August! You’re going to need a greenhouse! I love the Echeverias in those tall urns. Thanks for all the great info about them too. Oh I wish I had a green house but really too hot for one most of the time. Portland was so fun and full of inspiration! 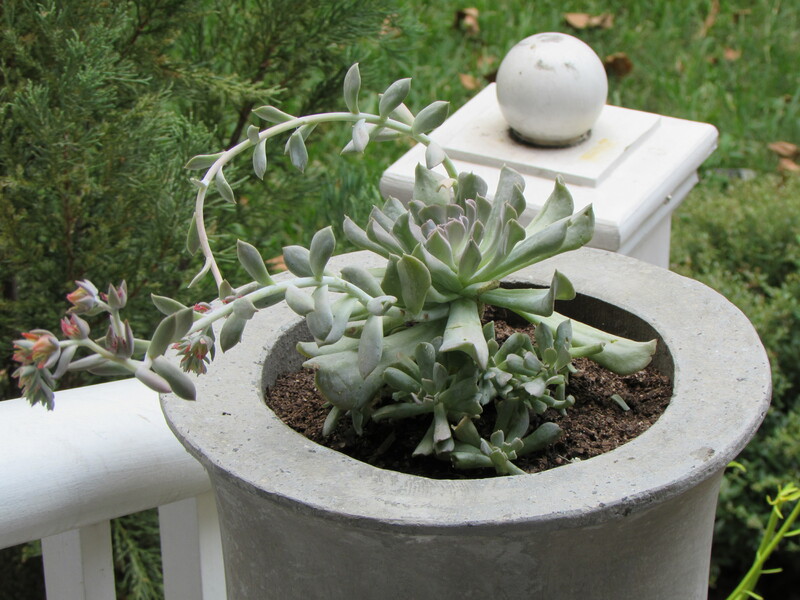 Your urns are stunning, especially with the Echeverias. Great info. Your Viola looks just like my Snowflake at 16. Thank you Loree…you garden was such and inspiration. It made me miss living in California! Lovely informative post. I used to hate succulents and I can’ t get enough of them now. I think you warm to them as you get more into gardening. They are wonderful for pots and so easy to propagate. It was a treat to meet you in Portland! Succulents are great in containers because you can observe their cool qualities even better when they’re up close and personal like that! I came across this article while researching a past garden blogger fling in Buffalo, NY then finding an upcoming one in Toronto, Ontario Canada …then the garden blogger fling Facebook page…then, well I came upon your page. You and I sat together at the National Garden Blogger’s conference in Atlanta. I enjoyed learning about the cultural requirements and display tips for Topsy Turvy echeveria. Keep up the nice blogging work! Hi David, I do keep up with you via FB : ) I learned so much at that conference and finally got my blog off the ground. So happy you found it!